A tradition in the United States and Canada, high school proms have become one of the most important events in a teenager’s life. In some countries it is just a party to celebrate a graduation from high school or even college; while in other countries it can be the most stressful event for a young person, intensifying the pressure over issues of inclusion and exclusion. Whatever the situation may be it, is a celebration that is expanding worldwide. The word “prom“ was used for the first time in 1890 as a short version of the word “promenade“ that referred to formal dances. In the United States, parents and teachers believed that a prom would be a good way to teach social skills to the students. In the 1920s, the first proms took place and a decade later they were popular across the country. In the beginning, proms were pretty modest, held in the school gymnasium and decorated with crepe paper. From the 1960s and until our days’ proms are more formal events with boys wearing tuxedos and girls in designer dresses arriving in limousines hired exclusively for that special night. 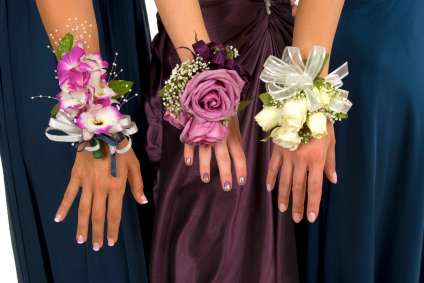 As part of the attire girls wear a corsage, generally, a wrist corsage, given to them by their dates and girls give boys matching boutonnieres. The tradition has been exported to several countries around the world that now have their own version of the high school prom. Some of them kept the same elements as the Prom in the United States and others made their own. Canada: Most schools have the same traditions as Prom in the United States, except it is strictly a ceremony celebrating the graduation from high school. Brazil: Prom is usual at the end of high school and at college graduation. Evening gowns and suits are required. Argentina: Proms are for students finishing their last year of high school. A big party in a local disco and school leavers usually wear a costume to be identified. France: Some schools or universities hold “gala” which are held as a social event each year gathering newly graduates and newly entering students. Germany: Students celebrate their graduation from high school with an “Abi-Party” or an “Abi-Ball”. They are not compelled to wear tuxedos or dresses. Italy: The equivalent is known as “Mak ? 100″ because it takes place 100 days before the students’ graduation in high school. It is not a formal event, and the students will often perform shows making a parody of their teachers. India: The equivalent is a farewell party. Students are given a warm send-off by the junior students with souvenirs and outstanding students are given awards. South Africa: The equivalent is the Matric Dance. It takes place during the final year of high school. It usually takes the form of a formal dinner and dance. In most schools, the 11th-grade class is responsible for arranging the event. If you are organizing a prom, now you know that you are not alone in that task. Thousands of people around the world are doing the same with clear cultural differences. But what is certain is that if we talk about a formal event we will for sure need to talk about decoration as well. Flowers, as in any other event today, have become increasingly important for decoration and even as part of the attire. The days of crepe-paper are over so the venue has to be decorated accordingly and what can be better than flowers to do the job!